Posted on Sunday, December 6th, 2009 at 6:00 pm. 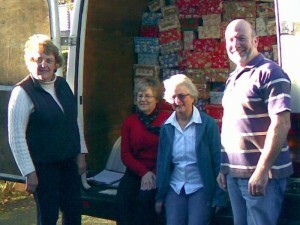 The members of S I Sutton Coldfield sent 571 shoe boxes ready wrapped for Christmas to Belarus. We have been involved in this project for 9 years and have progressed from 32 boxes the first year! They are Christmas gifts for all ages from 0 – 100! Belarus is still badly affected by the Chernobyl fallout. We work with the Chernobyl Affected Children Charity based in Leicester, we help to pay transport costs and throughout the year send non prescription hospital supplies, clothes, household items and toys.